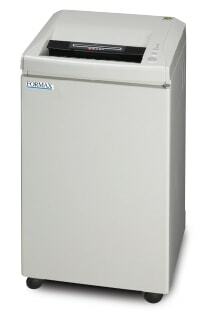 Formax FD 8300CC Deskside Paper Shredders Cross-Cut are as compact as a wastebasket, yet provide enough power to handle paper clips and staples. Two models offer on-the-spot destruction of sensitive paperwork, phone messages, and notes generated throughout the day. The Strip-Cut model can also shred CDs with its dedicated CD feed opening. The FD 8300CC Cross-Cut model can shred up to 8 sheets at once, up to 27 feet per minute, with a microcut shred size of 1/16" x 5/8".